CHA, Organization, and Makeup . . . Oh My! Wow. For those of you who have never been to a CHA tradeshow, imagine the biggest scrapbooking store you possibly can. And fill it with things you’ve never seen before! Add in a fabulous group of co-workers, friends from across the country, and people you’ve admired for years from afar and you’ll have a little idea of what this convention is like. I’ll say it again. Wow. Check out the CK blog for all of the official fun, including a tour of my favorite booth from the show and my wacky videos (thank you lovely Canon PowerShot). Funny story. We actually had to film the Hambly demonstration twice. The first time, cute Ashley N. Newell was making her bracelet and I was filming her hands while Allison talked — we were trying to kill a couple of those proverbial birds with one stone. And then . . . my SD card filled up! Noooo!! Luckily, Joannie McBride had brought along another camera, so I went back at the end of the day and we filmed take two with Allison demonstrating. This time we prepped a couple of bracelets and we kept saying “now, through the magic of YouTube . . . ta da!” I think we were both a little slap happy at that point. Allison’s such a trouper! Lots of fun going on at the office this week; in addition to more goodness from the CHA floor, the first issue in our new publication series has hit the newsstands: Scrapbooking Tips & Tricks presented by Club CK. 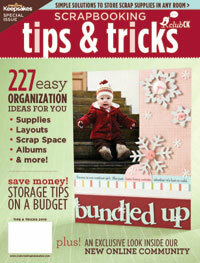 This issue, all about organization, is so inspiring! I’ve already found loads of ideas for my craft room when we get to that point in our remodel. Hooray! And, because our readers are so incredibly awesome, we’re offering a special discount on this issue to our blog followers: 20% off the newsstand price through February 15 when you purchase this issue here. Just use this code: TIPSB. On a personal front: our kitchen countertops are being installed on the 19th. Whoo hoo! I’ll be able to cook again! Also of a personal note, my little sister Tine and I are taking a makeup artistry class. It’s five weeks long, on Thursday nights. I can already tell that I’m going to learn a ton. Like, for example, the first thing we learned tonight was what our skin tone was. Our instructor, Andrea, had a bunch of different fabrics, one warm and one cool shade of each color. Now, I know that you can find out your skin tone by looking for pink or yellow undertones but. . . it’s hard! Andrea had us each, one by one, go up to the front of the room, and she would one at a time drape the fabrics across our shoulders so that the color was right against our faces. Warm green, then cool green. Warm red, then cool red. Ivory, then white. And so on. (But not black). And as she would do this, you could see people’s faces brightening and then going sallow. It was incredible! And, did you know that there are more cool-toned people in the world than warm-toned? My sister and I were the only two warm-toned people in the class. Frankly, this explains so much about my poor eyeshadow choices over the years. Oy. And Now Back to . . .
Hey, you mentioned me on your blog! WOW!!! I heart you Kim! Your make upp class sounds awesome! I hope you enjoy it! Clearly I’m very excited tonight with all the exclamation points. The class seems like a ton of fun!!! Wish I could find one around here!!! TFS! I have no idea what kind of tone I am. I must be doing it all wrong! Is that why I fear eyeshadow? Can’t wait for more posts! Hey Kim…I only just twigged that you might actually have a blog haha! From one warm toned person to another…color is everything isn’t it. EG. I look like I have a disease if I wear yellow. Yellow clothes that is…just in case you thought I might actually wear yellow eye shadow. PS: Pic’s of the kitchen counters please. Happy Saturday girl!